The credit score is a numerical expression based on the statistical analysis performed by lenders and financial institutions to access a person’s creditworthiness. Apart from many other factors credit score is a major contributor in determining whether to extend credit to a borrower or not. A person’s credit score is a number between 300 and 850, 850 being the highest credit rating possible. When you get a loan, lenders report your activity to credit bureaus, and that information is compiled into credit reports. In the past, lenders had to manually read through credit reports, which included lengthy details about a borrower’s history which were time-consuming, and it’s easy to miss important details. 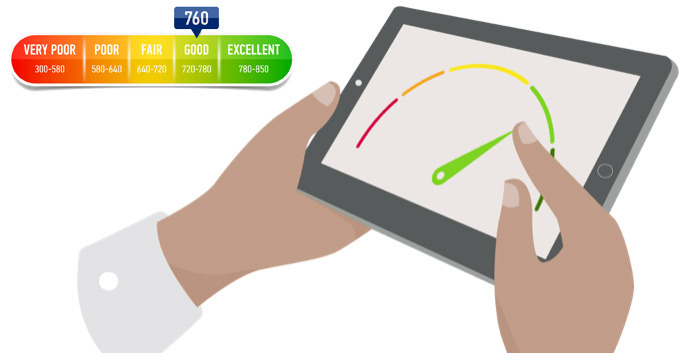 With credit scores, a computer program reads that same information and calculates out a score – a simple number that lenders can use to evaluate how likely you are to repay. Instead of spending 20 minutes on each loan applicant, scores take much less effort to generate. TransUnion CIBIL Limited is India’s first credit information company which collects monthly reports from banks and financial institutions, based on which credit score or CIBIL score is generated and used by lenders for evaluation. The higher the CIBIL score, higher are the chances of your loan application getting approved. It is important to know that nearly 90% of loans are granted to individuals with the score greater than 750. Pay Your Bills on Time: That goes for all your bills, not just your credit cards and loans. While certain bills don’t get reported to the credit bureaus when you pay on time, they could end up on your credit report if you fall behind. Even a small utility fine could wind up on your credit report if it’s left unpaid. Keep Your Credit Card Balances Low: The higher your credit card balance is, the worse your credit score will be. Your credit card balance should be within 30 percent of your credit limit to maintain a good credit score. Manage Your Debt: The lower your debt, the easier it will be to maintain a good credit score. Limit Your Applications for New Credit: Each time you apply for credit, whether a credit card or loan your credit score takes a small hit. Credit inquiries are only 10 percent of your credit scores, but if you have a high credit score (say 800), you stand to lose a lot of points (10 percent of 800 is 80). Watch Your Credit Report: Just because you do everything right with your credit doesn’t mean everyone else will. Errors could end up on your credit report leading to a drop in your credit Checking your credit report throughout the year lets you detect mistakes sooner so you can correct them and maintain a good credit score.